Copyright © 2011 -2013 by Poramate Manoonpong & BCCN Goettingen. All rights reserved. The AMOS II (Advanced Mobility Sensor Driven-Walking Device version II) is a new version of AMOS. AMOS II is a biologically inspired hardware platform. It was developed in collaboration with Fraunhofer Institute for Intelligent Analysis and Information Systems IAIS under Emmy Noether research project. It is used to study the coordination of many degrees of freedom, to perform experiments with neural control, memory, and learning and to develop artificial perceptionaction systems employing embodied control techniques. The motors allow AMOSII to carry a maximum payload of 6 kg while walking. The size of AMOSII is 30 cm wide, 40 cm long, 20 cm high. AMOSII has a number of proprioceptive and exteroceptive sensors, e.g., angle sensors, force sensors, current sensors, light sensors, infrared sensors, ultrasonic sensors. These sensors allow AMOSII to autonomously perform a broad behavioral repertoire including foothold searching, elevator reflex (swinging a leg over obstacles), self-protective reflex (standing in an upside-down position), obstacle avoidance, escape responses, phototaxis (turn towards a light source), climbing over obstacles, and five different gaits. Furthermore it can learn to adapt its walking pattern to a new situation. This robot can serve as a hardware platform for experiments concerning the function of a neural perception-action system. Its neural controller can be applied to advanced prosthetic and orthotic devices to generate more adaptive walking and motor planning. Each leg has three joints (three DOF): the thoraco-coxal (TC-) joint enables forward (+) and backward (-) movements, the coxa-trochanteral (CTr-) joint enables elevation (+) and depression (-) of the leg, and the femur-tibia (FTi-) joint enables extension (+) and flexion (-) of the tibia The morphology of this multi-jointed leg is modeled on the basis of a cockroach leg but the tarsus segments are ignored. Each tibia part contains a spring damped compliant element to absorb an impact force as well as to measure the ground contact event during the walk. In addition, passive couplings are installed at each joint in order to yield passive compliances and to protect a motor shaft. This high mobility of the legs enables the walking machine to walk in omnidirection and to perform a reflex behavior, e.g., standing in an upside-down position . Inspired by invertebrate morphology of the American cockroach’s trunk and its motion, a backbone joint which can rotate in a horizontal axis was constructed. It imitates a connection between the first and second thoracic of a cockroach. Thus, it will provide enough mobility for the machine to climb over an obstacle to lift the front legs up to reach the top of an obstacle and then bend them downward during step climbing. All leg joints including the backbone joint are driven by digital servomotors . The figure of cockroach' s climbing is modified from Ritzmann, R.E., Quinn, R.D., and Fischer, M.S. 2004. Convergent evolution and locomotion through complex terrain by insects, vertebrates and robots. Arthropod Structure and Development, Vol. 33, No. 3, pp. 361�379. The muscles are simulated based on a virtual agonist-antagonist mechanism (VAAM) consisting of contractile and parallel elements (CEs and PEs). "Virtual" here means that every joint physically actuated by a standard servo motor can produce variably compliant motions as if it were driven by a pair of agonist and antagonist muscles (see [3,8] for more detials). The AMOS II has a multitude of sensors: six foot contact sensors (FC), six reflexive optical sensors, seven infra-red sensors (IR), three light dependent resistor sensors (LDR), one upside-down detector sensor (UD), one inclinometer sensor (IM), one camera sensor (CM), one laser scanner sensor (LS), one current sensor (I). All these sensors are used to generate a broad behavioral repertoire including foothold searching, elevator reflex (swinging a leg over obstacles), self-protective reflex (standing in an upside-down position), obstacle avoidance, phototaxis (turn towards a light source), climbing over obstacles , five different gaits, and partially adaptation . Due to our special design of a robot connector, one could reconfigure the joint angles of AMOS II or even simply reconstructure it to obtain different types, e.g., pentapod and octapod robots. 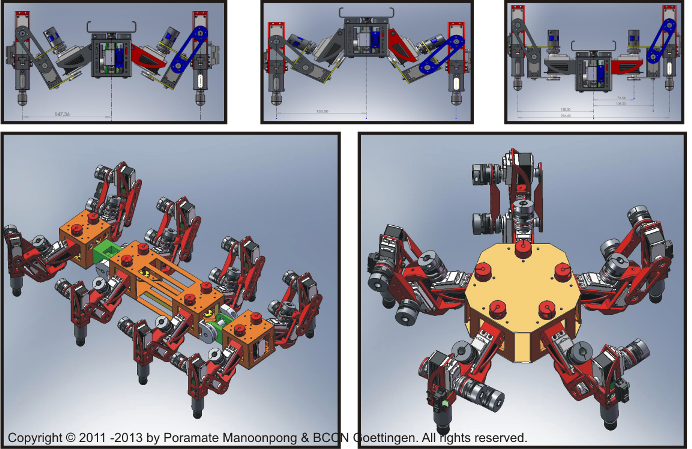 The controller generates insect-like, energy-efficient, and adaptable locomotion of AMOS II. This adaptive neural closed-loop controller consists of one CPG-based control unit and six local leg control units(read  for more details, Videos). We have developed self-adaptive reservoir. It is based on reservoir computing in which we have introduced intrinsic plasticity. It is aimed to be used as robot memory (see  for more details, Video). We have developed a simplified variable admittance controller applied to robot joint control. It is based on a virtual agonist-antagonist mechanism (VAAM) consisting of contractile and parallel elements (CEs and PEs). "Virtual" here means that every joint physically actuated by a standard servo motor can produce variably compliant motions as if it were driven by a pair of agonist and antagonist muscles. (see [3,8] for more details). Currently, the muscles' parameters for obtaining variable compliance are adjusted manually. The reactive backbone joint control supports the climbing behavior of the robot by emulating the body flexion observed in cockroaches. The controller was developed and successfully tested using our modular robot control environment, allowing physical simulation and simple transferring to AMOS II. 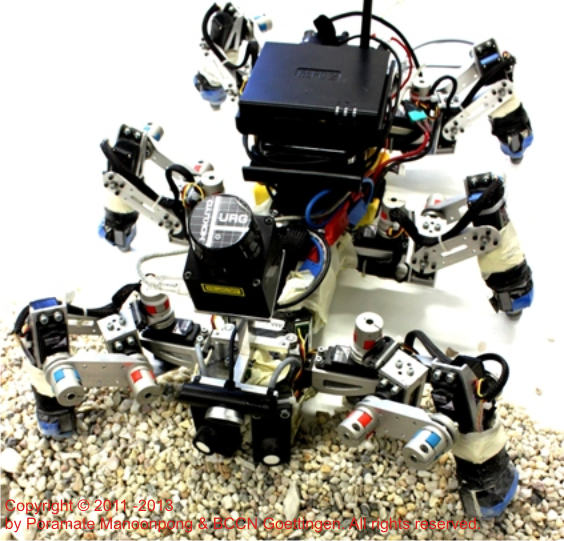 Experimental results show that employing this controller together with neural locomotion control and reflex mechanisms allows the robot to surmount obstacles with a maximum height of 13 cm which equals 75% of its leg length(see  for more details, Videos). Based on our previous development on chaotic CPG control, we have extended it to three CPGs, each of which controls a pair of opposite legs of AMOS II. Our experimental results show that one CPG might not be enough to maintain the body balance and compensate for leg damage. Instead, using CPGs can cope with this problem (see  for more details, Video). Currently, finding proper parameters for leg damage compensation is achieved by manual adjustment in an offline manner; thereby fast and autonomous adaptation of an individual leg cannot be obtained in the current state. 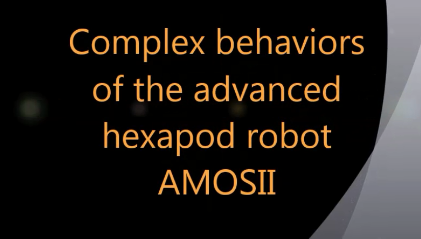 Manoonpong, P.; Goldschmidt, D.; Woergoetter, F.; Kovalev, A.; Heepe, L.; Gorb, S. (2013) Using a Biological Material to Improve Locomotion of Hexapod Robots. Living Machines: The International Conference on Biomimetics and Biohybrid Systems, London, UK, 29 July - 2 Aug 2013. Zenker, S.; Erdal Aksoy, E.; Goldschmidt, D.; Wörgötter, F.; Manoonpong, P. (2013) Visual Terrain Classification for Selecting Energy Efficient Gaits of a Hexapod Robot. The 2013 IEEE/ASME International Conference on Advanced Intelligent Mechatronics, Wollongong, Australia, 9-12 July 2013. Xiong, X.; Wörgötter, F.; Manoonpong, P. (2013) A Simplified Variable Admittance Controller Based on a Virtual Agonist-Antagonist Mechanism for Robot Joint Control. 16th International Conference on Climbing and Walking Robots and the Support Technologies for Mobile Machines (CLAWAR), University of Technology, Sydney, Australia, 14 – 17 July 2013. Kesper, P.; Grinke, E.; Hesse, F.; Wörgötter, F.; Manoonpong, P. (2013) Obstacle/Gap Detection and Terrain Classification of Walking Robots based on a 2D Laser Range Finder. 16th International Conference on Climbing and Walking Robots and the Support Technologies for Mobile Machines (CLAWAR), University of Technology, Sydney, Australia, 14 – 17 July 2013. The top image of this page is created from several images including the cockroach image modified from Ritzmann et al., 2004.